Fatehpur Sikri is an ancient architectural complex, which testifies to the culture of the Indian civilization in the 16 century. Fatehpur Sikri is a unique example of architectural ensembles of the highest quality construction in India. The complex is located only 40 km west of Agra, and the most famous - Taj Mahal. Fatehpur Sikri was built between 1571 and 1585 by the great Emperor Akbar. Fatehpur Sikri literally means City of Victory. It was the capital of the empire for about 10 years, but built in 16 century and remains today as one of the cultural monuments of India, who in 1986 was listed as a UNESCO World Heritage Site. The complex is a beautiful blend of Indian temples, and monuments erected in a unified architectural style. In Fatehpur Sikri is one of the largest mosques in India - Jama Masjid. 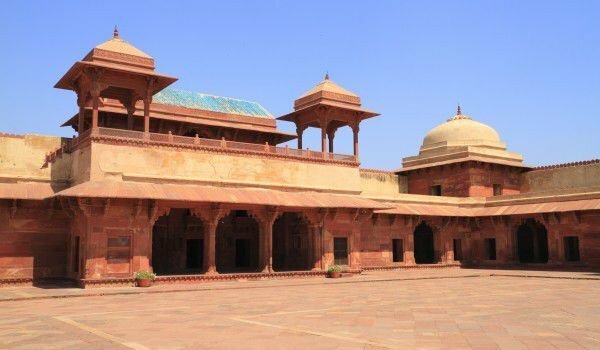 Fatehpur Sikri is the capital of the great Mughal emperor Akbar, who was an extremely charismatic personality. He possessed wisdom, torture and magnetism, and boasts undisputed military and administrative skills. Instead of having a modernized foreign government, he concluded the alliance with the rulers of the Rajput, having married a daughter of the Maharaja in Amber. Akbar started a dream of bringing all communities in India where all religions live together. Although he had many women, he had no heir. This led him to visit the saint Shaikh Salim Chisti, who lived in the village of Sikri. The saint foretold the emperor that he will acquire three sons. Not long after one of his wives became pregnant and gave birth to male heir, which in honor of the prophet was called Salem. Later, he remained in history as the emperor Jahangir. In recognition Akbar decided to build its capital at Sikri, adding to its name Fatehpur, which means victory. Fatehpur Sikri was built by the best architects of India and Persia for 14 years. During the reign of Akbar, North India reached unrecorded bloom. The king himself was illiterate, but around him he had collected the most wise and smart people of the country, nine of which are appointed for their ministers. They were all prominent and respected financiers, poets, musicians, artists, administrators and astrologers from all faiths and from diverse backgrounds. While he could not read, nor write, the emperor ordered the construction of a special library that held over 50 000 manuscripts. Akbar loved many of them read to him. He himself was a Muslim, but was keenly interested in all other religions at that time in India. In the Diwan-i-Khas, the ruler of Fatehpur Sikri organized regular debates between all these representatives of different cultures and religions. Akbar’s main desire was to unite them, in his attempts he created a new religious philosophy, which promoted both Islam, Hinduism, Jainism and Christianity. Unfortunately, as the religion of the ruler, all Fatehpur Sikri had a short history. Only after 50 years the village was abandoned and totally deserted because of lack of water. Although built 400 years ago, Fatehpur Sikri is extremely well preserved. It is divided into two parts - castle and pilgrimage. Pilgrim of a huge courtyard where you can visit the tombs of saint Salim Chisti and one of the largest mosques in India. To this day, this temple is one of the holiest places for the Muslim society in the country. Tomb of Salim Chisti is beautiful and masterfully crafted edifice of white marble. Just below the main hall there are kept the relics of the saint. His remains to this day are considered to be miraculous, many childless women and couples come here to pray for the child. People tied cotton threads on screens around the sanctuary, hoping for a miracle that they made him happy and Akbar was bestowed with an heir. The most impressive building in Fatehpur Sikri probably remains a vast and majestic building, called the Gate of Victory. Considered one of the highest gates in the world. Besides the incredible view, which is revealed in this part of the old town, you may read an inscription, dating from Akbar: "The world is only one bridge - go for it, do not build houses on top. The world is just one hour spent in prayer, the rest is invisible”.